‘MODERN CLASSIC’ is the recurring impression, each time I listen to this latest piano trio release, First Light, from Englishman in New York, Andrew McCormack. The trajectory of McCormack’s jazz career has been fascinating to monitor since his 2007 debut album, Telescope, through to the more recent digital-only Live in London of 2012. In between, his musical partnership with saxophonist Jason Yarde (in two impressive duo recordings, as well as captivating live performances), revealed much about his personality and musical drive – and a relocation across the Atlantic to immerse himself in the American jazz scene has now, excitingly, increased his compositional/improvisational creativity and technical accomplishment to the heights that are to be discovered here. Along with NYC rhythm section Zack Lober (bass) and Colin Stranahan (drums), the pianist delivers a precise set of eight contrasting originals, plus a closing interpretation of Thelonious Monk – and, pleasingly, the overarching feel is one of an intelligent and inventive trio at ease with their connective artistry, which makes for the most heartwarming chamber jazz experience. Bustling Prospect Park launches the album, perhaps suggesting the freedoms of Brooklyn’s urban oasis, McCormack’s morning-light piano seemingly dancing and cascading in the sun. The brisk, jaunty bass and drum tempo is particularly finely weighted, neither of the three players overshadowing the other, which enhances the sense of openness – and it’s a joy to experience McCormack’s exquisite keyboard touch throughout. Gotham Soul probes and twists to McCormack’s misterioso opening left-hand motif, gradually building in intensity but then pulling back to reveal a delicate double bass extemporisation against the combined subtlety of piano and drums – the communication lines here are most definitely clear, as the pianist closes with contrapuntal finesse. There’s a certain Monkish impudence and unpredictability to Leap of Faith, the trio’s jabbing punches transforming into McCormack’s effortless, melodic rolling across the keys to Lober’s steady, city-walking bass and Stranahan’s drumming intricacy. Title track First Light summons the cerebral sound world of Bill Evans, such is the measured lucidity of all three musicians – but, specifically, it’s the incredible detailing of Andrew McCormack, from held-back droplet melodies, through rapid high runs and chordal saturation, and then back to final, sustained simplicity which vividly paints that very first, quiet glimpse of daybreak. Lober’s opening chromatic bass edginess in Reluctant Gift contrasts well, eventually breaking into more confident ground until the whole trio flies at impressive speed, inviting a hard-hitting show from Colin Stranahan until its unexpected… STOP! Reflecting the cityscape impressions of the cover art, Vista quietly patters through shifting major/minors, building and fading as if to emulate the changing patterns of a day in the US capital, pitching tranquillity against the heavy hydraulic hiss of sprawling traffic. The River is more improvisatory in feel, ebbing and flowing to individual creative thoughts and a great combined bass and piano bass pulse, yet always cohesive. Its tense, jarring motifs are quite different to the earlier, reflective numbers; and elaborated live possibilities – hinted at by Stranahan’s colourful percussion – can easily be imagined. A brief interlude, Faith Remembered, recalls themes from the earlier Leap of Faith, expertly reinterpreting them into a pensive, perhaps melancholy, late-night piano solo. And then, to close, Thelonious Monk’s Pannonica, McCormack and his trio exchanging the writer’s trademark piano ‘clumsiness’ for a suitably bright’n’breezy evening walk in the park – full circle: first light to twilight. Released on 7 July 2014 by increasingly successful British label Edition Records – superbly recorded/produced and packaged – First Light is available in digital and CD formats from their Bandcamp store. Certainly the mark of a consummate pianist/composer with a maturing, distinctive voice… and an album to treasure. Thank YOU, Martin. Edition Records (Dave and Tim will tell you) have long impressed me with their vision of recording and promoting excellence in jazz (and now, of course, edition Classics). 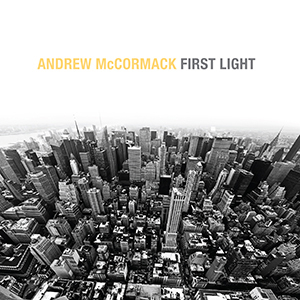 Andrew McCormack’s ‘First Light’ is an indicator of the high calibre of artists associated with the label, and – listening closely – a mark of contemporary jazz greatness from an intelligent and creative musician. Long may Edition and its artists prosper!